Many people on the East Coast look to faraway places to experience an outdoor adventure. Some travel as far away as Utah, California or the Pacific Northwest for an overnight camping spot. However, a great escape doesn’t have to be a trek to a remote area of the U.S. or some distant land. 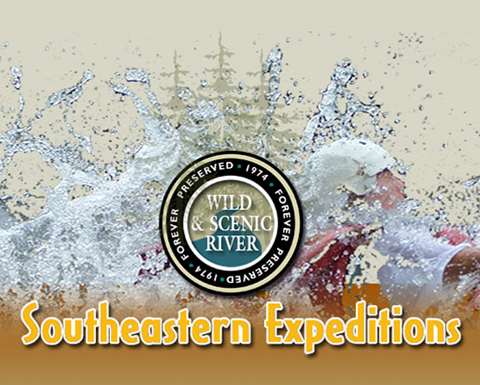 Southeastern Expeditions offers exciting overnight camping just a stone’s throw away from North Carolina, South Carolina, Georgia, Alabama and Tennessee. If you’re looking for overnight camping spots closer to home on the East Coast, you don’t want to miss out on all the attractions offered by Southeastern Expeditions. Southeastern Expeditions hosts whitewater river rafting on the mighty Chattooga River. The Chattooga has Class I to IV rapids. Don’t worry – we don’t throw anyone into the deep end. We start beginners with paddling in a moderate class II section of the river. River rafters must be at least ten years old. Of course, if you have some rafting experience and want more of a challenge, Class III and Class IV advanced sections are waiting for you. After taming the wild and scenic Chattooga, you’ll spend the night in the beautiful Sumter National Forest. Sumter National Forest offers an array of colorful scenery, abundant wildlife and lively hiking trails. Overnight campers must be at least twelve years old. Camping with Southeastern Expeditions includes a night sleeping under the stars in the forest. All you need to bring is a sleeping bag, a camping mattress pad and your thirst for excitement. No need to worry about food rations and MREs, either. Your adventure includes four scrumptious meals. We start you off with a nourishing buffet lunch, followed by a hearty barbecue dinner. There’s a bountiful southern breakfast in the morning and we fortify you for the road with another delicious buffet lunch. You’ll be aided by our team of expert guides throughout your stay with us. Our guides know the river and the forest like the back of their hands. They are there to make sure you have everything you need for your trip and to help you navigate the river and the campgrounds. Overnight camping is great for teambuilding exercises, group celebrations, corporate retreats and youth group expeditions. Ask us about our special group rates. We can also customize your overnight camping trip to meet the needs of your particular group. 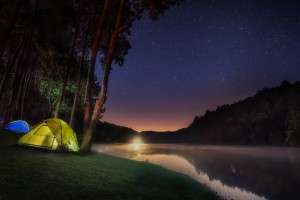 What’s the Best Overnight Camping Destination Convenient to the Southeast? Southeastern Expeditions is just two hours away from Greenville, Asheville, and Atlanta. It’s only about three and a half hours from Chattanooga and four hours from Birmingham. If you call any of these areas home, the Southeastern Expeditions outpost is a convenient destination for a fantastic overnight camping getaway.